that exhibits premium products and allows you to see the latest collections from the following sectors. 62.932 visitors: Premičre Vision Pluriel demonstrates the strength and coherence of its shows. “Exceptional energy. Greatly increased activity. Effective and adapted responses”. This is what we could hear on 17, 18 and 19 September in the busy aisles of the Premičre Vision Pluriel shows. Around the 1,950 exhibitors present, the 62,392 international professionnals (+3.6% vs Sept. 2012) gathered at the Paris Nord Villepinte Exhibition Park, enthused about the energy of an edition that was intense, rich in discussions and extremely productive. After regularly growing over a number of sessions, all six shows broke new records this season. In addition to the optimism and effervescence in the air, a real resumption of activity could be felt. The solidity and the international attractiveness of the shows are more real than ever. Is this the sign of the economic recovery that the industry has been expecting? The future will tell. But one thing is certain. Thanks to some audacious risk taking and strategic choices; thanks to an offer that is selective, complementary, qualitative and creative; thanks to its unique inspirational role and its specialised marketing of the sector, Premičre Vision Pluriel today is more than ever in tune with the needs and the expectations of the fashion sector and the international markets. A sector which has been shaken structurally and economically in recent years by the financial crisis is now focussing on innovation, creativity and quality to move forward and resolve its difficulties. 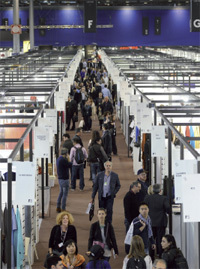 The show increased considerably in size, proof of its dynamism and its growing reputation with the 17,000 professionals from the leather industry who visited from around the world (+16.5%, not including EEC against Sept.12) and from throughout Europe (+22% against Sept. 12). More exhibitors, more visitors: CUIR Ŕ PARIS, the show organised by the French national leather council, Le Conseil National du Cuir, and supported by the entire French leather industry, which for its 25th edition was inaugurated by Arnaud Montebourg, the Minister for Industrial Renewal, has acquired a reputation in the sector that delights all associated with it. Firmly targeting the luxury and premium market segments, the quality of the products exhibited by the show’s 450 international exhibitors remains of the same high standard, despite this expansion. All the exhibitors questioned were delighted with the quality of visitors, all of who came from the leading luxury and premium labels. “More and more visitors focus on the CUIR Ŕ PARIS show,” a professional told us. This is demonstrated by the mainly European origins (80%) of the show’s visitors, and resurgence from French buyers (+20.5% against Sept. 12) and their Italian counterparts (+17% against Sept.12). Certain exhibitors commented on the arrival of new labels from northern Europe, particularly from Holland (+47%) as well as the healthy increase in British visitors (+27%). Those who were asked commented on the substantial presence of North American visitors and also Canadians (+25%). This upward trend is also seen with visitors from Asia, namely China, Korea and Taiwan (+17.3% against Sept.12). Synonymous with luxury and an indicator of prudence, classics continued to be the leading request from visitors for all categories of skin. 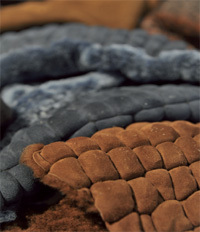 For lamb leather, dipped versions “with plenty of fullness” as Jean- Charles Duchęne from Mégisserie Alric describes them, remained the leading product in the ovine category. “Clients are focussing on classic products that fully express the beauty of the leather”, adds Philippe Joucla from Mégisserie Lauret. Double-sided leathers have earned their place in the contemporary wardrobe, and continued to be popular, despite any climatic considerations. Renowned for its characteristic grain, goat leather was also favoured in its most natural form. However, as the manager of Averpeaux remarked, “we still end up adding a protective layer to offer it a certain resistance.” Calf and bovine leather were also preferred without any artifice, so that their delicate grain could be admired on the shoes and bags that they adorn. 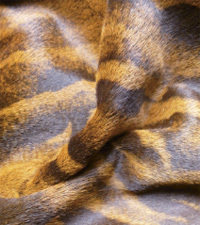 Finally, leathers in their shaggy versions were the most fashion-influenced, with big cat markings from Liderkoll and the camouflage prints from Dias Ruivo. Over in the precious skins category, demand for crocodile continues to increase. But, as the ultimate luxury product, it was in a position to show more boldness and creativity than the more ordinary leathers. Irrespective of whether it was back cut or front cut, python emphasised its exoticism in very colourful printed, varnished or lasered versions; or contrasted with more discreet colour-free, monochrome or nubuck versions. On calf, lamb and goat leather, the aniline or semi-aniline finish glorified the perfection of the skins and the finesse of their grain, and in doing so enchanted designers and buyers. A touch of shine with a delicate satin finish adds a subtle sheen without altering their natural look. In contrast, the ultra-mats, which were considered to be too covered, did not achieve the hoped-for success. Suedes, and particularly bovine hides, provided an air of comfort that is welcome for the Winter season. But “from a practical point of view”, as Grégory Meiler from Rial explained, the underside of sheepskins is given a nappa rather than a suede finish. As for crocodile, it inspires passion in clothing finishes, despite the exorbitant prices due to the size of skins that is needed, their finesse and their softness. This Autumn-Winter 2014/2015 is firmly betting on chilly weather, with a warm colour palette dominated by browns in all their various hues, from chestnut to caramel, via fawns, cognac, Havana and golds. Dark reds, like claret or bull’s blood, further intensify the palette. Khakis provide a more natural, rather than military touch whilst blues soothe things with their reassuring calm. Unshakeable black remains the priority for buyers who are well aware of the preferences of the final consumer. Once again, the show will be held at the same time as the Premičre Vision, Modamont, Indigo, Expofil and Zoom by Fatex shows.